・ Using PPS diaphragm, it maintains high durability and quality even in high humidity environments. ・ By use of a specially designed suspension holder, it can isolate camera motor noise in camera mount use. ・ Basic design is M-S, but it includes M-S to L-R circuitry, and allows a direct L-R signal. The CMS-10 provides extremely high-resolution audio to match today’s advanced picture quality. This versatile microphone is switchable between a very sharp directional Mono and rich Stereo in environmental imaging. Stereo angle is 127°. 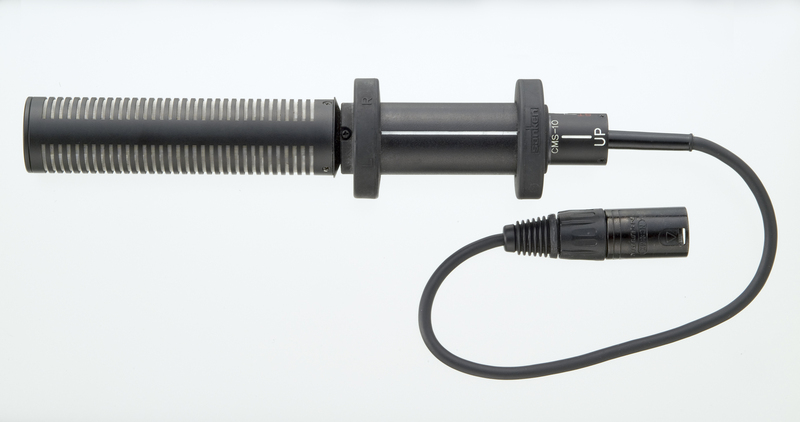 Unlike conventional shotgun microphones, the CMS-10 uses a unique second-order pressure gradient design, enabling precision directional response through multiple cardioid elements in a front-back array. The capsules combine line microphone performance and second-order gradient response in a single compact system. Stereophonic localization depends primarily on signal accuracy and channel separation in the 400Hz to 3kHz range. Pattern control of the CMS-10 has been optimized in this range. Very low and very high frequency response has been optimized along the frontal axis so that the "target" on-axis sounds are clearly delineated.